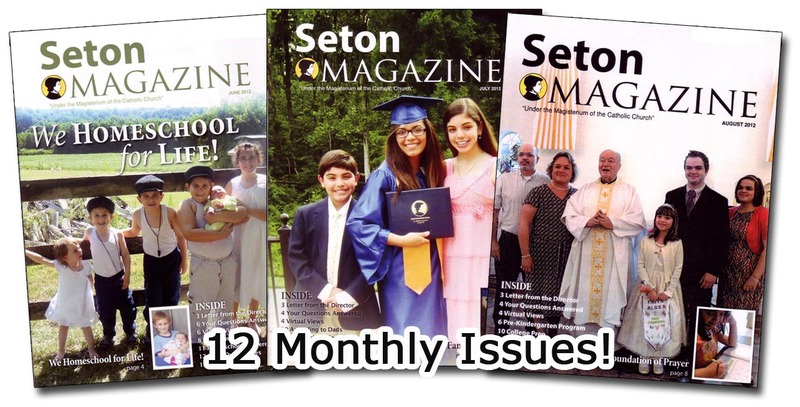 Receive 6 bi-monthly issues of the Seton Magazine, the official magazine of Seton Home Study School. This is an invaluable resource for homeschooling parents! This is an invaluable resource for homeschooling parents! Filled with homeschooling tips, conference announcements and inspirational articles. Gives parents more tools to make homeschooling successful. Includes a monthly letter and Questions and Answers from Seton's Director, Dr. Mary Kay Clark, practical insight from homeschool veterans, and a Homeschool Dad's view from John Clark. All these features PLUS there's a Featured Family story with pictures. 24 pp. Full color.